From the looks of all the new sitcoms premiering this fall season it appears that dysfunctional family relationships, and parents in particular, will be great cannon fodder for comedy in the months to come on our televisions. 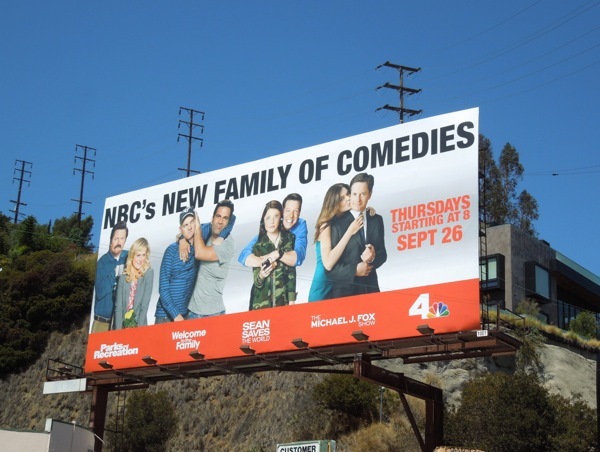 Here's a special bonus selection of billboards to help kick off another TV WEEK here at Daily Billboard, with ad creatives for new shows Mom, Dads and NBC's new family of comedies on offer this coming TV season. First up is the new sitcom starring very funny ladies, Anna Faris and Allison Janney, which centers on a newly sober single mom and her formerly estranged mother who is eager to test her daughter's sobriety with her passive-aggressive insights. Neither lady is a stranger to the big or small screen, so it will be interesting if these women can find that mother/daughter chemistry in hit-maker Chuck Lorre's new CBS comedy. 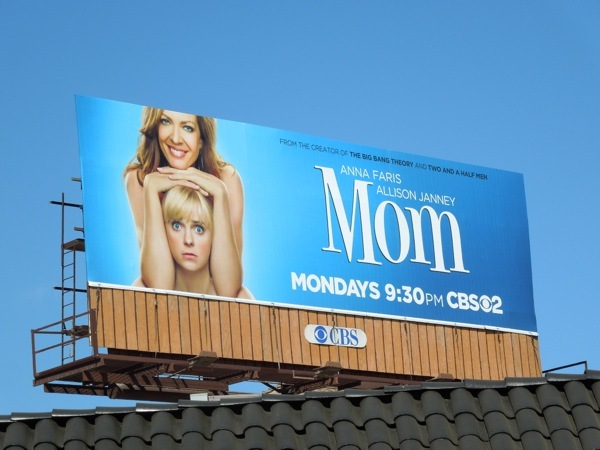 This simple, but fun billboard for the series premiere of Mom was spied along Santa Monica Boulevard on August 22 and later along 3rd Street on August 31, 2013. 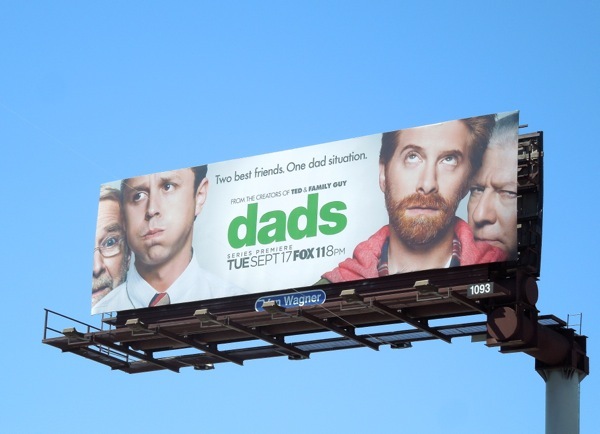 Meanwhile flipping genders, Fox's new comedy focuses on the trials and pitfalls of the father-son relationships in Dads. The funny thing is that the ad creative for this sitcom features equally distressed and exasperated expressions from the grown-up children, so the stress your parents cause is obviously a real universal theme. Seth Green and Giovanni Ribisi are the best pals whose pain-in-the-neck dads (played by Peter Reigert and Martin Mull) move in to turn their worlds upside down in this comedy from the guys that brought you Ted and Family Guy (so they know a bit about dysfunction). 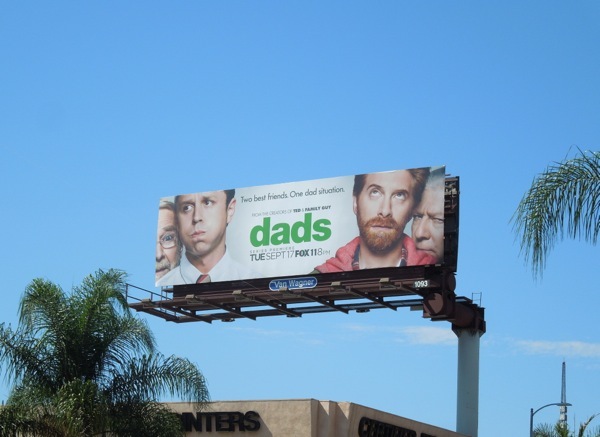 This witty billboard for Dads, which even sports the same green font as the Ted movie (no doubt to make that association), was spotted along Cahuenga Boulevard near Sunset Boulevard on August 20, 2013. Finally for today, here's a billboard which uses the most of its advertising space by supporting for of its sitcoms, including returning favourite Parks and Recreation, starring Amy Poehler back for a sixth season at the Parks and Recreation Department of Pawnee, Indiana. Joining the established show this season are newcomers Welcome to the Family, Sean Save the World and The Michael J. Fox Show. In Welcome to the Family an unexpected pregnancy brings to families and their two cultures together, with Glee's Mike O'Malley and Desperate Housewives Ricardo Chavira as the two patriarchs of the white and latino families forever bonded by their children. Sean Saves the World sees Will & Grace's Sean Hayes returning to sitcom land as divorced dad trying to be the prefect father, juggling work and life, when his 14-year-old daughter moves in permanently. And then there's The Michael J. Fox Show in which the titular star plays a news anchor who gave up his work to focus on his health and family when he was diagnosed with Parkinson's, but five years later with his kids grown up he feels it may be time to jump start his career again (sounds like a project that would be close to the actor's heart). 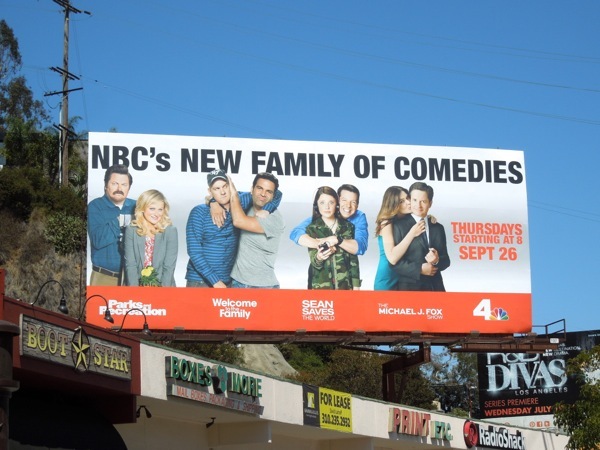 This composite 'family of comedies' billboard was spied along Sunset Boulevard on August 21, 2013. Add all these shows to new CBS sitcom The Millers (and many more to follow no doubt), and it looks like it's going to be a battle royale amongst the rival families this fall season. 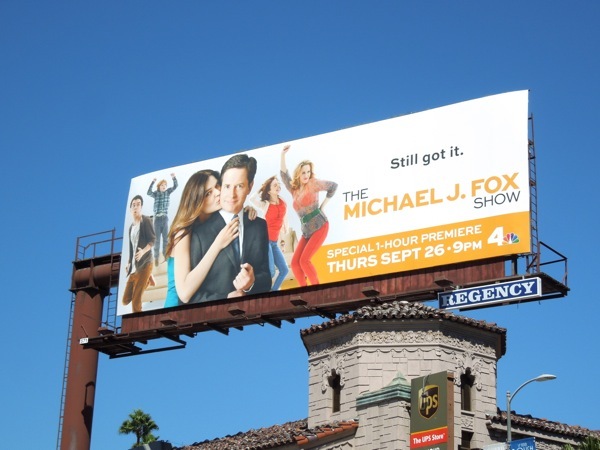 UPDATED: After sharing a billboard with NBC's other comedy shows, someone finally had the good sense to give The Michael J. Fox Show it's own billboard, after all he is a beloved Hollywood star and deserves the spotlight for his new series. This 'Still got it' billboard creative was spied at the intersection of Sunset Boulevard and Crescent Heights Boulevard on September 16, 2013.